Look! Up In The Sky! It's A Bird! It's A Plane! It's A Tobacco Lobbyist Superman Threw To His Death! 1) When did Snidely Whiplash get hired by the R.J. Reynolds corporation? 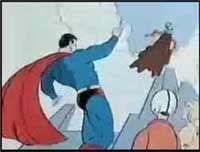 2) Why does Superman speak with a Slavic accent? Was Krypton actually a small town in Poland? 3) I know the guy was trying to get kids to smoke deadly cigarettes, but isn't it going a little too far to hurl him hundreds of feet in the air? Maybe Superman threw the guy at a mattress factory so he'd land on something soft. But if exposing children to carcinogens is so terrible, why does Superman zap them with his powerful X-ray eyebeams?